Ethonomic Indicator of the Day: 93% of U.S. soybeans are genetically modified. Frankenfood! It’s the evil-sounding name given to genetically modified crops by organic enthusiasts fearful that altering nature’s design will result in irreparable damage to either the environment or our bodies. And there is a good chance that they’re right. The fight against GM crops has been intensifying of late, with the USDA approving modified alfalfa early this year, despite protests from big organic (which might be less worried about the potential risks and mostly worried about their organic certification). Because a cow that eats GM alfalfa is no longer organic, no matter how it was raised, and GM alfalfa has the extra ability to spread like kudzu–even to places where it’s not supposed to be, like an adjacent field of original-gene alfalfa. That’s right. Nearly 100% of all soybeans grown in the U.S. are genetically modified to resist weed-killers that used to also kill the soybeans along with the weeds. 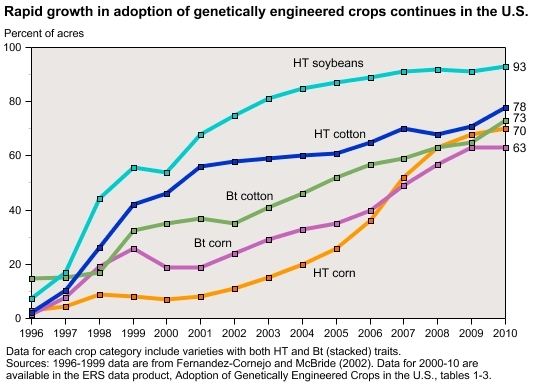 And Bt cotton and corn–which have had genes from a soil bacterium Bacillus thuringiensis jammed inside them to help them resist insects–both comprise about three-quarters of all the acreage of that crop. The era of the frankenfood is already here. If it turns out to be a devastating problem, it may be already too late. Take a look at your lunch today–corn syrup, anyone?–you’ve likely ingested some modified strands of corn DNA. How are you feeling? Better question: How will you be feeling in 50 years?